[Adventure] Trouble at Imp Brücke. tomorrow in issue number 8 of Dyson’s Dodecahedron. Imp Brücke refers to both a small collection of buildings (too small to be even called a thorpe) and an ancient stone bridge crossing the Pearl river near it’s junction with Scale Creek. The bridge has been here for centuries and shows little sign of the ages passing – sufficient magical investigation (outside the scope of this adventure) can determine that it was originally constructed by earth elementals under the control of a magus of the three circles. The bridge itself is made of a hard brown stone and arches smoothly over the Pearl river. Along the sides of the bridge are the shapes of many misshapen faces with open mouthes staring at the river. Or they might just be heading through along the road when they run into the ambush at area 7. This small collection of homes and outbuildings is the sum total of the residents of Imp Brücke. A scattering of solitary farms exit to the west and the farmers make trips every few weeks to Imp Brücke for trade and news. There are four buildings of interest to the average traveler here. Tromeo Reggiano (1 gp) – Epicure lapses into death-like sleep for 1d4 days; upon waking, save vs poison or awaken as mold-zombie. Orange Marbled Brick (4 gp) – improves the eater’s saving throws against poison by +1 for 24 hours. Soft Barrel Cherry Cheese (5 gp) – causes a strange tingling sensation in the consumer’s extremities for d8+1 hours, no other effects. Speckleroot Hard Cheese (7 gp) – consuming this cheese increases a character’s healing rate by 100% when combined with a full day’s rest. Pink Kleebus (8 gp) – Grants +2 bonus to AC, at the cost of -4 to all reaction rolls. The effect lasts for 6 hours, culminating in an epic visit to the latrine. Ancient Lavender Creme (9 gp) – Save vs poison or permanently lose 1 Con. Regardless of save result, gain +2 on all future saves vs poison. Wax-Bound Dogwood Cheese (10gp) – A hard wheel bound in bright red wax. Has a shelf life that can be measured in decades (at least, until the waxy rind is broken open). No canine — not even a hellhound or lycanthrope — can resist this cheese; it is the ultimate bribe where dogs, wolves, and the like are concerned. Juniper Curd (12 gp): For the next 12 hours consumer automatically “turns” insects each round as if a 1st level cleric turning undead of similar HD. Truvan Beaver Cheese (15 gp) – causes horrendous indigestion and nausea (-1 on attack rolls for 12+d12 hours) but saving throws against spells cast by the consumer are at a -2 penalty during the first four hours. Brindlburn Abbot’s Gold (25 gp) – consuming this cheese prevents death for 20 minutes unless completely dismembered, disintegrated, or similar. The Iron Hammer – a small inn and the only standing stone building in the area, the Iron Hammer is run by Ol’ Chumpin’, a rotund man in his mid-30’s who inherited the inn from his father. During the day there will be 1d4-1 travelers and farmers here, but an additional 1d4+1 will arrive in the evening. Over the hearth of the main room is a massive iron warhammer, rusted and pitted with age. It is actually a +2 weapon that deals an additional +5 damage against earth elementals and other earth-based creatures. Maltooth’s Smithy – this small smithy makes iron goods for the local farmers. He also has a fine-looking two-handed sword hanging by the entrance that he is inordinately proud of but will sell for double the normal price. It is actually a poor weapon, and will break the first time it rolls maximum damage in combat. The Burned House – this house burned down last night… Today everyone is trying to ignore it, pretending it was an accident and not something worse. The family in the burned out house had been talking about fixing up the old mill by the river. I knew that place was cursed! There’s always been goblins living in the bridge. But they are our goblins. Don’t leave the road when traveling north of here. The tower is a death sentence to those who wander too close, and the giant cat-tails of the swamp hide other foul beasts. Also referred to by locals as “Sid’s fort” and “Sid’s ruins” and “the pile o rocks on the hill”, no one in the area ever goes here because it is known to be dangerous, but also a danger that doesn’t seem to extend beyond the immediate area of the tower. The tower itself was once 50 or 60 feet tall, but now only the bottom 30 feet are intact, with crumbling remains above. The multiple interior levels have all collapsed, leaving a large interior space with a high, stone ceiling. Those invading the tower or messing around with the upper areas will find themselves besieged by oversized (3 foot long) red stirges (AC: 7, HD: 2+1, Mv: 30 (10), Fly: 180 (60), Att: 1, Dmg: 1d6+1, Sv: F2, M: 10, Special: First attack against a target at +2 to hit, blood sucking for 1d6+1 dmg per round). There are 14 of the foul beasts within the tower defending the Stirge Heart. Eight will fly out to defend the tower, the remaining 14 waiting until someone breaches the interior, turning the old ruins into a frenzied tornado of blood sucking beasts. The stirge heart (AC: 6, HD: 10, hp: 43, Mv: 30 (10), Att: 1, Dmg: 5d4, Sv: F10, M: 8) is attached to the ceiling of the tower. When targets come within reach it lashes out with one of it’s six root-like tendrils up to 50’. If it hits with a tendril attack, the tendril latches onto the opponent’s body. This deals no damage, but drags the opponent to the stirge heart’s mouth at a rate of 10’ per round and the victim suffers from weakness for 1d4 rounds. A character must succeed at an open doors check to break away. The stirge heart appears to be the mutated and oversized remnants of a human or humanoid, almost “splattered” onto the ceiling of the chamber, with strange tendrils of flesh covering the ceiling and leading down the walls. It can talk, but is almost unintelligible and has 3 Int. If the heart is slain but any of the red stirges escape the extermination, the red stirge will create a new stirge heart in time, using the genetic material of the last sentient creature the stirge fed from. 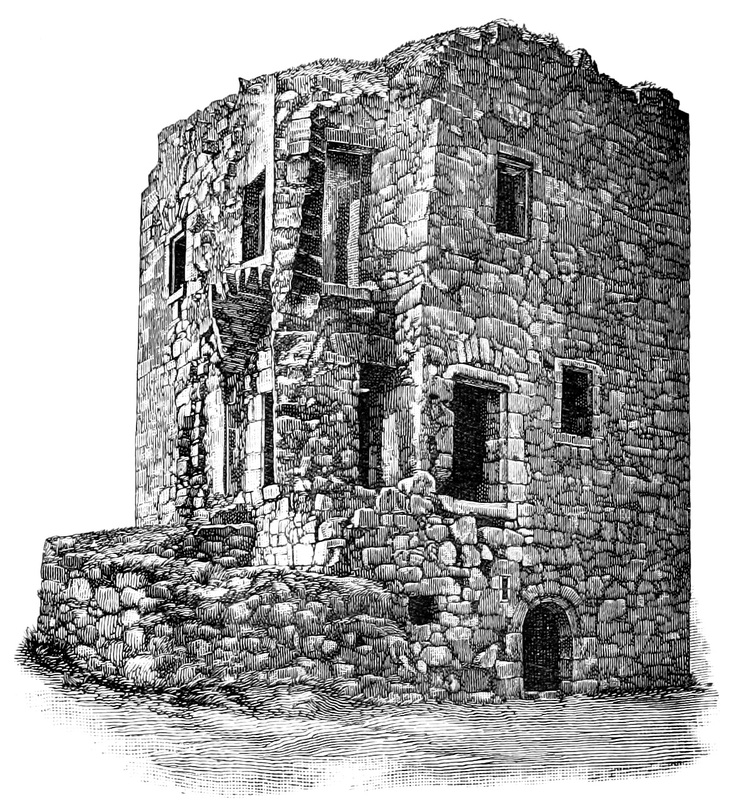 Under a ruined stone chair on the west wall of the tower is a small locked and rusted iron coffer containing the old deed to the building and land, genealogical charts for the Sidral clan and the Sidral signet ring. This collection would be worth between 500 and 3,000 gp, (1d6 x 500 gp) depending on the buyer. Abandoned for at least 20 years, the wood of these two buildings is starting to rot and the smaller house has partially collapsed. After last night’s debacle, two twisted and chaos-touched greater goblins (AC: 5, HD: 5, hp: 20, 26, Mv: 60 (20), Att: 1, Dmg: 1d6+1, Sv: F5, M: 7, special: berzerk frenzy grants +2 to hit and damage in melee) are hiding here waiting for the sun to set so they can return to their kin in area 6. Unfortunately the thing that temporarily visited the town during the failed summons also rendered these two insane – they have completely lost the ability to make any form of sense, and instead will attack non-goblins on sight and will cower and hide when among their kin. A pair of dire wolves (AC: 6, HD: 4+1, hp: 19, 20, Mv: 150 (50), Att: 1, Dmg: 2d4, Sv: F2, M: 8) are kept here under the guard of the mud beast (AC: 6, HD: 7, hp: 29, Mv: 60 (30), Att: 1, Dmg: 1d8+2, Sv: F7, M: 7). The mud beast was a goblin that was horribly twisted while undergoing his ur-goblin transformation. The goblins don’t know what caused it, but he no longer resembles his kin, and must keep himself wet otherwise he weakens rapidly. When slain it appears that he is mostly mud, with a few bloated internal organs in the mix. The mud beast carries a massive club, and has a coffer chained to his belt that hangs between his massive knees. The coffer is locked (the goblin chieftain has the key) and contains 2,000 ep. Massive cat-tails make this swamp stand out as unusual – they easily tower twenty feet tall and are two to four inches across. There is nothing particularly special about the swamp besides this overgrown species of reed. This natural cave has been expanded by the goblins living here and their forefathers. All sections show some amount of inexpert stonework, mostly to level the floor and make enough head room for goblins to move about. Except in 6e and 6h, ceilings are low – topping out at 5 feet tall. 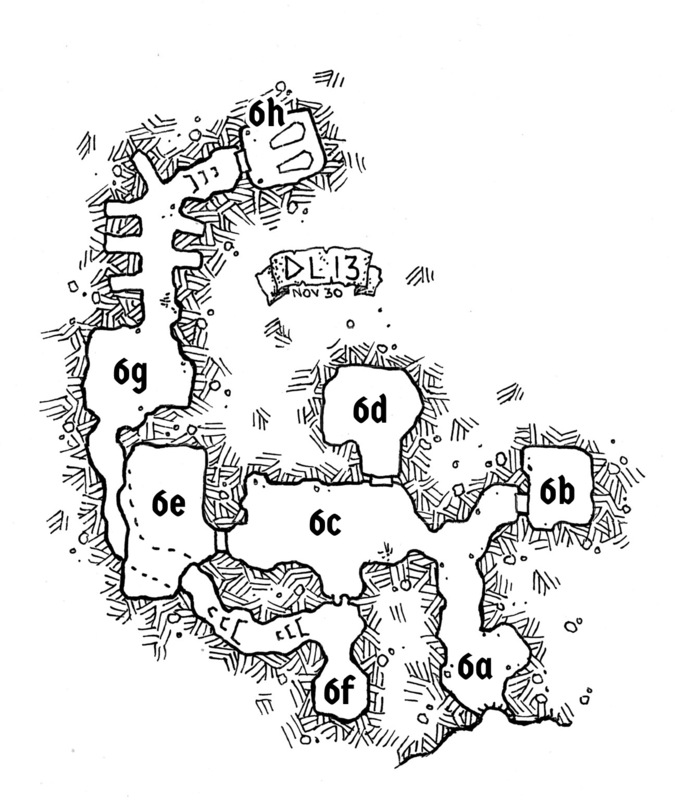 As would be expected of goblin caves, 6a through f are littered with the debris and detritus of goblin life. Door frames are a mix of rough-cut stone and rough masonry with heavy, squat oak doors. 2 Goblins (AC: 6, HD: 1-1, hp: 4 each, Mv: 60 (20), Att: 1, Dmg: 1d6, Sv: F0, M: 7) stand guard here. If they spot approaching foes, they will throw their javelins and then one will run to 6c to sound the alert while the other stands his ground (if his morale will let him). This room is used to store goods acquired by the goblins when they pillage distant villages and other humanoids (they never cause trouble in Imp Brücke if it can be avoided). It is currently home to a dozen small barrels and wooden boxes of mildewed cloth and grains. Part way down in one particularly foul barrel of grain is a severed elven hand holding a silver piece. If allowed to finish drying, this foul talisman will bring it’s wearer a +2 bonus on all saving throws. If the silver piece is removed from it’s grasp, however, the person who removed it is cursed to nightmares of an armored elf strangling him in his sleep. This prevents sleep (and thus spell preparation and natural healing) until the curse is lifted by a remove curse. The majority of this small goblin tribe lives here. 10 goblins (AC: 6, HD: 1-1, hp: 4 each, Mv: 60 (20), Att: 1, Dmg: 1d6, Sv: F0, M: 7), 4 greater goblins (AC: 6, HD: 3, hp: 9, 11, 12, 13, Mv: 60 (20), Att: 1, Dmg: 1d6+1, Sv: F3, M: 8) and 2 goblin champions (AC: 5, HD: 5, hp: 20, 26, Mv: 60 (20), Att: 1, Dmg: 1d6+1/3d4+1, Sv: F5, M: 9, special: the 26 hp champion wields RuinCaller, a magical battleaxe with a +2 bonus to hit that deals 3d4 damage) will defend this space as long as they can, retreating to 6e if they fail their morale, or for the front entrance if that exit is available to them. Sounds of fighting here will alert the Ur-Goblin in 6d who will enter the fray after 3 rounds. In this low-ceilinged chamber, the chieftain of the goblin tribe keeps his harem of 3 fierce goblins (AC: 6, HD: 2, hp: 7 each, Mv: 60 (20), Att: 1, Dmg: 1d6, Sv: F2, M: 7). The ur-goblin chief (AC: 4, HD: 8, hp: 32, Mv: 60 (20), Att: 1, Dmg: 1d6+2, Sv: F8, M: 9, special: can cast stone shape 2/day, wall of stone 1/day) is a massive and twisted ur-goblin seemingly carved from the dark rock walls themselves. He attacks with a massive Rod of Earth that grants him +2 on all saving throws as long as he is standing on dirt or rock. Once per week he can use the rod to summon an 8 HD earth elemental (AC: 2, HD: 8, hp: 36, Mv: 60 (20), Att: 1, Dmg: 1d8, Sv: F8, M: 10, special: can move through earth and stone, attacks against targets standing on earth or stone deal +1d8 damage) for 12 turns that will follow his will as long as he holds the rod. If the rod is released or the bearer is rendered unconscious (or slain) before the duration is done, then the elemental becomes hostile and uncontrollable and will attack the wielder, his kin, and companions. He also has the key to the money coffer in area 4. His harem is bedecked in the finest jewelry looted by the tribe over the decades – a total of 4 pieces of jewelry worth 600, 900, 1,200 and 1,400 gp. This natural cave towers above the rest of the goblin hole with a 15 foot ceiling glittering with wetness. The room is lit by a supernatural blue light coming from a font of water in the north end of the room. The natural bowl holds about a gallon of water that emits light like a continual light spell. The water loses this glow when removed from the font. Anything placed under the water within the font will emit blue light with the intensity of a candle for 48 hours once removed, but will then wither away as if aged 200-400 years once the light goes out. A save vs spells will prevent both the light and the withering, but only one save is made for both effects. The secret door to this room is a chunk of stone wedged into the cave walls, leaving only a crack a few inches wide that can be discovered with a successful roll. From the inside, this stone can be easily moved by pushing on the wooden lever attached to the base. It is significantly harder to open from the goblin lair side. Within this small chamber is the aged goblin shaman (AC: 6, HD: 5, hp: 15, Mv: 60 (20), Att: 1, Dmg: 1d6, Sv: C5, M: 11, Special: Can cast fear 3/day, spiritual weapon 1/day and striking 1/day) and his apprentice (AC: 6, HD: 3, hp: 15, Mv: 60 (20), Att: 1, Dmg: 1d6, Sv: C3, M: 8, Special: Casts fear 1/day and spiritual weapon 1/day). They will stay out of any conflict in the caves beyond, quietly praying that they won’t be found. The floor of this cavern is covered in rounded stalagmite formations that nearly reach the low ceiling, and practically blocking access to the crypts beyond. Getting past these stalagmites without making contact with them requires a roll against the character’s Dexterity – 2. If a non-goblin touches a stalagmite they suffer as if the victim of a cause serious wounds spell. The safest way to deal with these stone formations is to smash them with a large blunt object like a hammer. The crypts beyond this chamber contain the bones and dessicated bodies of many a dead goblin. Two rough stone sarcophagi rest in the centre of this 18’ tall chamber. One is open and has recently been disturbed (by a young goblin who didn’t believe the teachings of the shaman). The second remains sealed. The disturbance of the ancient champion is why the mud beast in area 4 failed his ur-goblin transformation, and no further goblins in this tribe can succeed at such a transformation until the bodies are laid to rest again. The disturbed sarcophagus is now overflowing with a trio of yellow molds (AC: nil, HD: 2, hp: 12, 15, 9, Att: spores, Dmg: 1d6, Sv: F2, Special: 50% chance to spray spores filling the room when contacted, save vs poison or suffocate in 6 rounds, only damaged by fire). Beneath the molds is the rotted corpse of an ancient ur-goblin entombed with his black short sword ElfBiter. The sword has a +2 bonus to hit and deals d20-8 damage (minimum of zero), or d20-4 vs elves. The second sarcophagus will spring open as soon as a tool is put to the lid in an attempt to open it, propelled by the mass of mold and fungus within that has taken the form of a shambling mound (AC: 0, HD: 8, hp: 36, Mv: 60 (20), Att: 2, Dmg: 2d8/2d8, Sv: F8, M: 12). The shambling mound contains the body of the ur-goblin champion within it, still wearing a platinum crown (1,400 gp) and a pair of platinum bracers (900 gp each). Thinking the clan has been betrayed, the unstable ur-goblin chief has sent out his kin to ambush any passing humans that come this way. Two of his champions (AC: 5, HD: 5, hp: 20, 26, Mv: 60 (20), Att: 1, Dmg: 1d6+1, Sv: F5, M: 9) and six goblin kin (AC: 6, HD: 1-1, hp: 4 each, Mv: 60 (20), Att: 1, Dmg: 1d6, Sv: F0, M: 7) have buried themselves in the leaves at the forest’s edge and attack any who approach. Their excellent camouflage and skills at stealth and hunting allow them to surprise on a 1-3. Any survivors from the ambush will retreat down the forest trail towards area 6. Trouble at Imp Brücke is a free adventure for your Labyrinth Lord, Dungeons & Dragons, or other fantasy OSR game. It is made available for free because of the awesome support of my patrons. 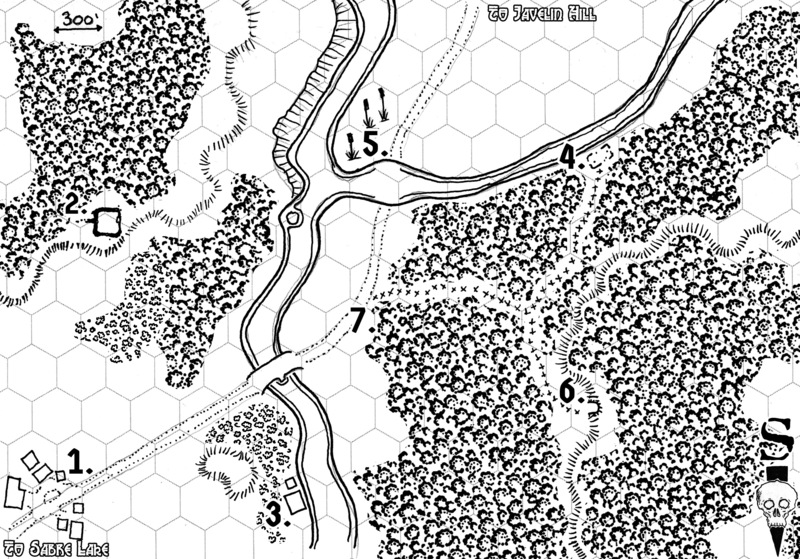 If you like these maps and adventures, maybe you would like to become a patron of these works also – check out my Patreon Campaign for more information on how to be part of the process that makes these maps and adventures free for all. When there still was only a ford over the brook called Flottbeck, there were quite often accidents with carriages, thought to be the deeds of the devil. Consequently, when a carpenter was hired to built a bridge at this place, he hired the devil for help, and promised to him the soul of the first being to cross the bridge. When a priest had consecrated the bridge and was just about to cross it, the people shooed a rabbit over the bridge, and so the rabbit was the first being to cross it. Your campaign link at the end is spelled incorrectly.